Q. When can we say we are HIPAA compliant? Q. What are the key HIPAA requirements? Q. Who do I need a Business Associate agreement with? A. A Business Associate is a vendor of a Covered Entity (CE) or another Business Associate (BA) that needs access to or stores electronic Protected Health Information as a regular part of the services they provide. Common examples of BAs are IT companies, billing companies, and transcription companies. Cleaning companies are not BAs. For additional information on Business Associates, please visit https://www.hhs.gov/hipaa/for-professionals/privacy/guidance/business-associates/index.html. We at Modern Practice Solutions recommend a Business Associate Audit yearly to ensure you have signed agreements and have properly identified your Business Associates. We also will submit Business Associate Agreements on your behalf. 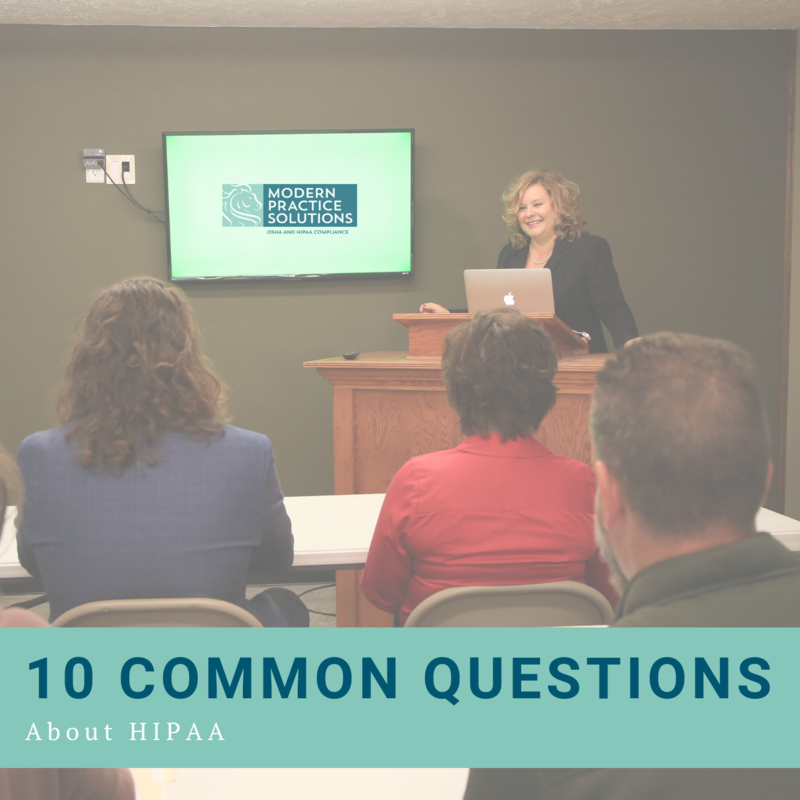 It is the responsibility of the Covered entity to follow up and ensure all BAAs are entered by the Service Provider and maintained in your HIPAA policies. Q. Do I need to retrain my employees every year? A. As a practical matter, yes. If you don’t train your employees every year, it will be listed as an area to focus on in your Risk Assessment. Under the Security Awareness and Training Standard § 164.308(a)(5), periodic retraining should be given anytime there is an environmental change, a change in policies, upgraded or new software, or a change in the HIPAA security rule. The Security Awareness and Training Standard address periodic security updates based on if it is a reasonable and appropriate safeguard to implement. Examples of periodic security reminders are: monthly meetings, monthly newsletters, and posted security reminders. Periodic security reminders can be in printed or electronic form. Q. Can I send email to patients? A. There are two circumstances in which it is permissible to email patients. If you have encrypted email, it is always fine to email patients. Also, if you do not have encrypted email, but if a patient signs a release saying it is okay to email, then you are fine. Ensure you have prior authorization from the patient prior to sending any unencrypted email. This is hard to keep track of and will generally be impractical. Best practice is to just electronically communicate with a patient through a secured/encrypted portal. This is secure and also keeps track of all communications for you. Q. Is Ransomware a reportable breach? Q. What is the difference between a security incident and a breach? Q. How often should we perform a Risk Assessment? A. The HIPAA regulations allow organizations to perform Risk Assessments on a frequency they deem appropriate. However, CMS/HHS require Security Risk Assessments (SRA) for Meaningful Use, MACRA, and the Diabetes Prevention Program to be performed yearly. This is now the de facto standard. As a best practice, and to meet HHS standards, everyone should perform an SRA at least once per year. According to the guidance on Risk Analysis Requirements under the HIPAA security rule, Risk Analysis should be ongoing. Some covered entities may perform Security Risk Assessments annually or as needed (bi-annual or every 3 years). It is recommended that when a covered entity has experienced a breach, a security incident, new technology, added satellite locations, or turnover in key staff, another Risk Assessment should be performed to reassess if additional security measures or updated policies are needed. We have provided you a link for additional resources as a Guidance on Risk Analysis Requirements under the HIPAA Security Rule. Q. Do I need to perform a vulnerability scan? A. Yes. Identifying technical vulnerabilities is a requirement of the HIPAA Security Rule. According to HHS: “The Security Rule requires entities to evaluate risks and vulnerabilities in their environments and to implement reasonable and appropriate security measures to protect against reasonably anticipated threats or hazards to the security or integrity of ePHI.” However, the HIPAA Security Rule does not specify the frequency in which this should be performed. A vulnerability scan is an inspection of potential areas within your workstations, server, and networks to identify possible security holes or weaknesses. How often you get a vulnerability scan completed is a considered discussion you should have with your IT department or IT vendor. Remember, a vulnerability scan helps not just with HIPAA, but also with your organization’s cybersecurity posture. We have seen horrible breaches and huge penalties that could have been prevented if a vulnerability scan had been run. IT/hacking incidents and unauthorized users are the current top two reasons of breaches for 2018. Q. Do I have to encrypt my laptops? cell phone policy and staff have reviewed and signed the policy regarding the use of personal cell phones.